Going up into high school can be really scary. Making new friends, settling into a new environment, coping with advanced course material and increased homework can be a real challenge. So your children need all the help that you can give them. Math Wiz is a structured course, written especially for Canadian school children. This means that your child is learning exactly what is needed to achieve success in school. At Grade Aid Learning, we know that not all children are learning Math at the same pace. So we conduct an assessment to find out exactly where your child should start and make sure that we provide you with the right programs. Learning Math is like building a wall with 'bricks of knowledge'. If some of these bricks are left out, the wall will crumble, at this point students can lose confidence and subsequently start guessing. So it is really important to choose a program that thoroughly supports what is taught in Canadian schools. Most importantly, Grade Aid Learning offers complete Grade 11 and 12 courses written to your province's curriculum. This is vital, because it provides student's with the complete picture. Knowing that their work is being monitored by a tutor, and that a goals are being supported by someone outside of the home, encourages students to utilize the tutoring program on a regular basis. Our tutoring staff can also provide proactive guidance to students who are not working in a productive manner... perhaps they are guessing instead of studying, they may be working at a curriculum level which is too demanding, or simply idling. It's very easy to upload reports to our tutors. You simply click a button on the menu and all of your children's reports will be sent to our secure web-server. 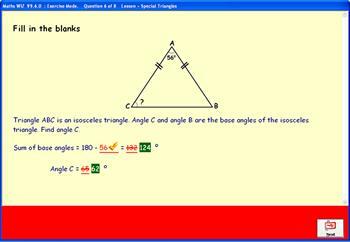 "Level 4" in Math Wiz is the work that is supposed to be completed and thoroughly understood by the time a student has finished primary school. Unfortunately many students enter High School without a full comprehension of some of the key concepts that will be required as a foundation for future learning. Students who have not mastered these topics, may get left behind and never make satisfactory progress in Math. We find that our students develop their understanding very quickly and are able to progress and catch-up on the "Level 4" program, so that they are thoroughly prepared for more advanced work throughout High School. Math Wiz is developed for Canadian kids, so you can be sure that your child is supported throughout their schooling. "Level 5" Math Wiz supports the first two years of secondary school. Also, it is essential revision for Grade 9 and 10 students. At this level students are required to learn how to solve more complex Math problems and start on new topics, such as "Algebra". In Secondary Math, you must learn how to write out your workings correctly in order to achieve full marks. "Level 6" Math Wiz is the advanced Secondary School work that should be achieved before commencing Grade 11. This is more challenging work so it is vital for students to have a good foundation in algebra. Tutorials are engaging and easy to understand. Every lesson has a set of questions designed specifically to reinforce learning. These questions are randomly selected from a pool of suitable questions, developed by our tutors and panel of teachers. 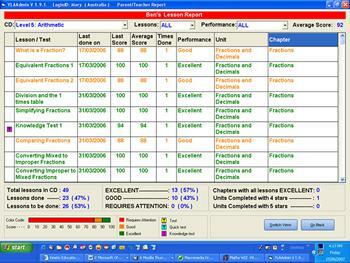 Each question is immediately marked by the computer so that the student has instant feedback. Optional step-by-step solutions can be provided at the click of a mouse button so that students can understand each concept fully before moving on. This ensures that students won't suffer from the frustration that comes with getting stuck on Math homework and not knowing what to do next. In the High School Math lessons, the questions aren't quick questions - they have several steps of workings. Every question in each lesson has a full explanation as well as a full solution. This appears one step at a time, just like a tutor prompting you. If you still don't understand after trying out the solution steps, you can phone the homework helpline and our friendly tutors will guide you. Runs on all recent Windows operating systems including Windows 98, Windows 2000, Windows XP, Windows Vista and Windows 7. A minimum of 128MB RAM, 4MB VGA Card, 1.2GB Hard Drive space available, Sound Card and Speakers or Headphones. An online version of the program is available for Apple Mac computers, for more information please discuss this with one of our consultants. Math Wiz really helps you to understand what you didn't understand in School. 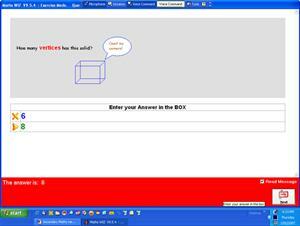 "I have been using the Math Wiz program since the middle of last year. It has been helping me a fair bit with my work especially with my Math. I recommend the program to people of all ages and think it would help many people, especially with using the tutors who give so much help". "Math Wiz has helped me to be awarded one of my school's academic scholarships. I have been able to learn and receive extra assistance without the worry of seeking this from elsewhere, and still be within the comfort of my home".